As I said in my previous post, I made these Triangle Parathas or Ajwain Parathas to go with Paneer Takatak and there could not have been a better combo ever 🙂 These parathas are very simple to make and are quite flavorful, with just one ingredient – Ajwain. The peculiarity of these parathas is the shape. While the preparation of the dough is quite similar to any usual roti/Indian bread, the way these parathas are rolled makes all the difference. On rolling a ball of dough into a thick roundel, a few drops of ghee/clarified butter is spread on it. The roundel is then folded in half which in turn is folded in half again. 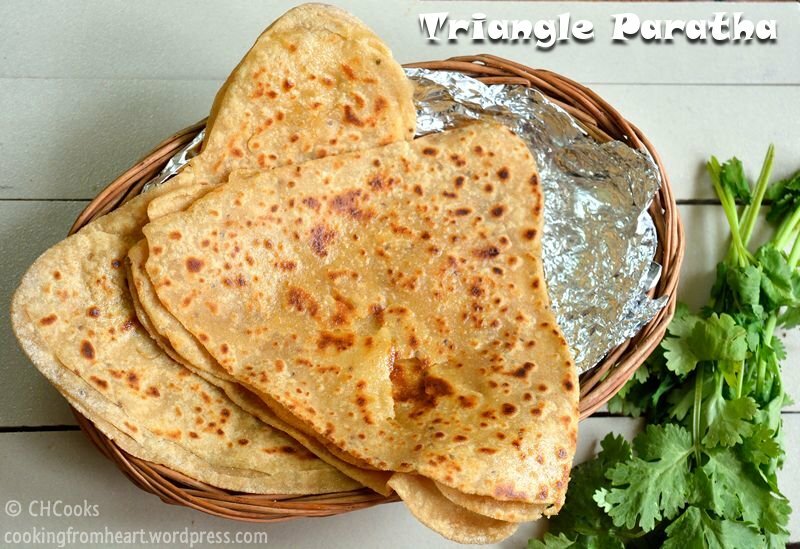 This shape resembles a triangle and on rolling this out to thinly, the paratha kind of retains the triangular shape. On cooking this paratha on a tawa, distinct layers would be formed – which makes it quite tasty to eat. In a bowl, add the whole-wheat flour, salt along with Ajwain seeds. Sprinkle water little by little and make a tight dough. Knead the dough for atleast 5-7mins and add the tsp of oil on top. Let the dough rest for atleast 20mins. Make the dough into equal sized balls. Take each ball of dough and make a thick roundel. Apply few drops of ghee/clarified butter on top of it and rub equally all over. Fold this roundel n half and fold the semi-circle in half again. Prepare all the balls of dough into these triangles. After dusting each triangle with additional wheat flour, roll them in to moderately thin parathas. 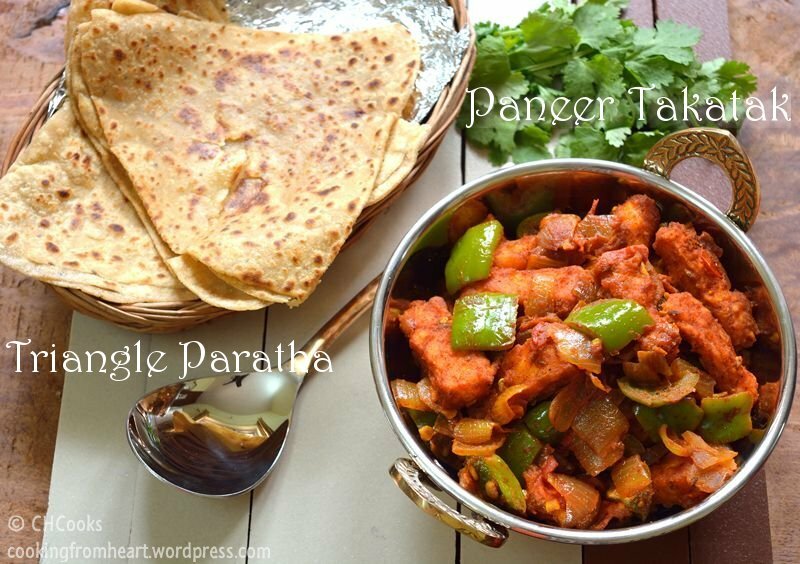 Heat a tawa and cook these triangle parathas on medium flame until golden brown on both sides. Few drops of oil/ghee can be used while cooking the parathas. After all the parathas are cooked, slightly crush them sideways between both your hands so that the layers open up. Serve hot with Paneer Takatak or any other side dish. Ajwain is a must for this paratha and adds to the flavor. Instead of coating the paratha with ghee, one can spread oil as well. While cooking the paratha, few drops of oil can be added so that it doesn’t go too dry. 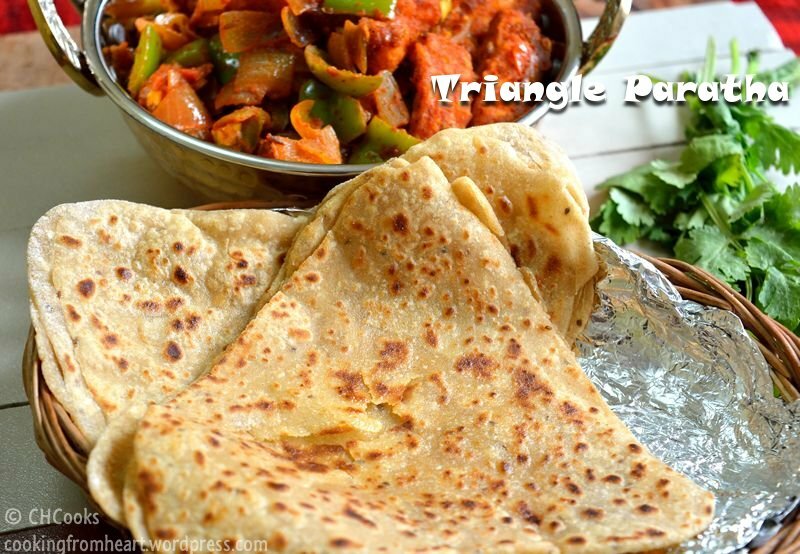 Try to maintain the triangular shape of the paratha while rolling it. The paratha can be made as thin as possible and that gives quite thin layers. If you wish, this can be made thick as well in which case it will be soft. Slightly crushing the prepared Parathas sideways between your hands is only to separate the layers. Most of mine had layers visible even while cooking. Very delicious! Are they hard to make? Thanks a lot! Welcome here 🙂 No they are not hard to make at all. You need to roll them, thats it. Use some extra flour if the dough is too sticky. Ok i will try! I made something called rote? sorry if that is not the name, it has been years. I learned from a friend, but that was years ago. Are these at all like rote? oh ok! I will try!